It's finally Spring and that means progress at Stanley Condos is not slowing down! Currently our team is hard at work forming the columns and walls on the 18th floor. As the bones of the building are coming together, there are a number of different aspects that will be progressing at the same time. In the south west corner of the building, the completion of the curtain wall window system is clearly visible. A curtain wall is made up of commercial grade windows that are installed to by-pass the concrete slab edge. The podium height was specifically designed to match the same height as the old Maple Leaf Gardens and Stanley's "glass box" provides a beautiful contrast to the vintage brick across the street. As we go inside the building structure, contractors are working to complete the metal stud framing for the demising walls (the walls that separate each unit) on the 2nd & 3rd floor. 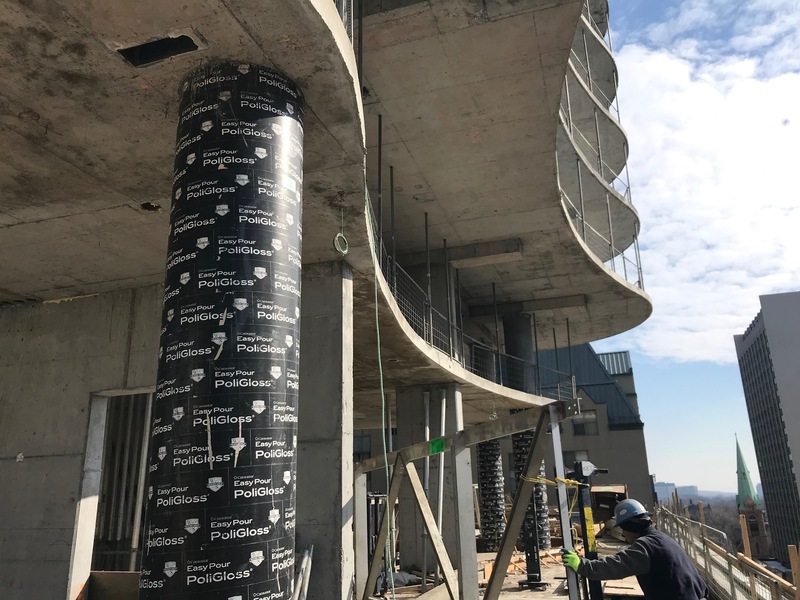 The mechanical contractor has also begun installation of the fancoil units, which are the mechanical systems that will provide both heating and cooling for each suite. Each unit is separately metered ensuring that homeowners are in full control of how much energy they use. On top of all this progress, the amenity terrace is also coming along, as the forming contractor is preparing to remove their shoring materials. These materials support the form work in order to pour concrete and hold until the concrete reaches optimal strength. Permanent power was turned on as of early March 2019 and mechanical rough-ins such as electrical outlets and ductwork are at the 2nd floor level. Once complete, Stanley Condos will beautifully capture the unique essence of its neighbourhood. It's a place where convenience is tangible luxury, with everything you need just steps from your door. From unique bars and restaurants just a short walk up the street, easy access to the TTC, major shopping and more, Stanley is a place where you can always count on a great time. « A New GO Station Coming to Woodbine!